With arresting songwriting, groove-oriented guitar playing, and a soulful, compassionate voice, Chuck Brodsky has quickly became a fixture on the USA acoustic music scene. 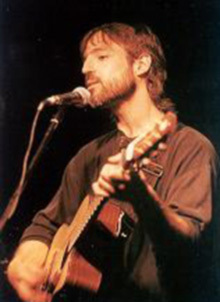 In 1992 he won the Emerging Songwriter Award at the Napa Valley Folk Festival in California. His debut CD, A Fingerpainter's Murals (Waterbug Records, 1995) was a critical favorite with its collection of vividly rendered stories--from a farmer losing his land ("Acre by Acre") to a washed-up pitcher trying to hold on a little longer ("Lefty"). But the song that cemented Brodsky's reputation as a funny and trenchant songwriter was "Blow 'em Away," a delightfully nasty blues about a pistol-packing commuter.